In general terms mould in properties is caused by one of two things. Firstly there is moisture penetration of the walls coming either through from outside, or from a leaky roof or faulty guttering. This type of mould is usually a variety of black and brown colours and may even have a raised fungal element to it. 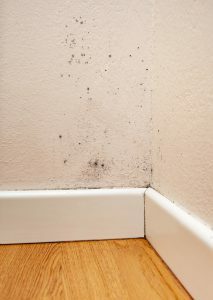 The other form of mould is usually referred to as black spot mould, because that is predominantly what it looks like. If you have mould that looks like it is from water penetration or a leak, then you need to get a builder or surveyor to come and inspect the property to ascertain exactly what the problem is. However, if the mould is predominantly on the surface and consists of numerous black spots, usually up in the corners of rooms around the join between wall and ceiling, then the cause of this is bad ventilation and, to a degree, the use of the wrong paint. With the price of electricity and gas so high these days, many people have reverted to drying their clothes on a clothes rack or clothes horse. Years ago this worked because homes had draughty windows and open fires, so there was plenty of ventilation. However, today, many modern houses are almost hermetically sealed, so when you now dry your clothes, there is nowhere for the moisture to go. As a consequence it will condense in the coldest parts of a room. Often this will be on a north-facing wall which never warms up as it never gets the sun. The other problem is that there is a type of paint, vinyl silk, which has a shiny surface and is said to be ideal for kitchens and bathrooms as it wipes clean. That is all very well and fine, but unfortunately it does not allow walls to breathe in the way a matt paint will allow them to do. So, water vapour condenses on the wall and eventually mould will begin to appear. There is no reason why you can't use vinyl matt paint in kitchens and bathrooms and the dull surface allows for condensed water to be absorbed more easily and then the wall will dry out slowly and naturally. However if black spot mould exists, then you have two options. Firstly, while wearing protective rubber gloves, you can wash the surface with a H2 solution of bleach and warm water. This will both remove the mould and also kill any remaining spores. If the wall is then not left with a stain, it will not need repainting. If a stain has been left, then it is advisable to use a blocking paint. This can either be a proprietary brand of stain block paint, or you can use oil-based undercoat if it is simply mould caused by condensation and not a leak, and then apply emulsion paint over it.